If there was a lesson from NAMM and Messe 2012 it was that controllers are the now. Every DJ manufacturer has some sort of MIDI unit for sale, and they are all trying to figure out exactly what the average user wants out of a new toy. When I got my hands on a CDJ 700 it was surprising how much it stood out surrounded by pieces of kit with nothing but flashing buttons and knobs. CD decks, in my experience, seem to be getting extremely cluttered with 1-to-1 functionality leading to a frustrating experience with just too many controls way too close together; or, conversely, the layered functionality is so poorly constructed that it becomes a struggle to access the more complex features. On first glance the CDJ-700 is far from cluttered, instead looking well spread out with large buttons and bright LEDs. The unit has a classic CDJ look, putting everything you need exactly where you’d think it would be without going overboard. The box is packed with exactly what you’d expect: a power cable, an RCA cable and a CDJ-700. The buttons are large with clear writing and have a resounding click, leaving no question they’ve been pressed, and, even better, there aren’t that many of them. It has a long throw high resolution pitch fader, a large format jog wheel with a clear LCD screen right in the middle to track your progress, and all the other bells and whistles we’ve come to expect. One design decision that bothered me just a little was the placement of the USB key port and SD media slot right by the browser and screen. I found this to be awkward as these are not things I need constant access to, and felt like I would knock the USB key out of place if I was too fast with my hands. I would have rather these ports be placed off in the upper right hand corner with the Mode buttons and replaced with the jog wheel start/stop speed knobs. Or just put them in the back so I can plug in whatever I need and not need to worry about it anymore. After toying with the unit and just turning knobs and pressing buttons I began to get acclimated to the nuances of the controls. It also didn’t hurt to have a look through the manual as there are a lot of layered functions here. So let’s go through the unit piece by piece to explain how it feels. The first thing I noticed was the screen is laid out as a portrait display. The narrow screen severely hampers the amount of detail shown in the wave form, forcing it to be scrunched a little too tight. This would be forgivable if the scrolling view was vertical, which was my initial expectation, but it isn’t. The screen, though, is bright, clear and detailed. While the commands are a little too close together if used as a touch screen, the general display is very well laid out. While the wave form is single tone it clearly shows you necessary peak information, and when hotcues and loops are loaded they are bright and easy to see. As a functional touch screen and not a static display, though, I have some concerns with how it is implemented. It is as if Gemini wanted to provide something that could be really fun to use, but instead offloaded all of the functionality to the hardware in a far more elegant fashion. If they had just provided a beautiful color display it would have been just as useful, and not felt as gimmicky. In all of my testing I never found myself drawn to it for actual use. The controls are all, in general, very smooth. The LEDs are bright, and all of the buttons are easy to read. They have an audible and clear click, and I noticed no latency between press and action. The one thing Gemini handled very well was packing a lot of control into as few buttons as possible, while still leaving those layers elegant. The one exception to this is their pitch/clock control and BPM editing. There were a lot of features crammed into these buttons and it ended up a little overwhelming. I understand BPM and pitch are linked, but the implementation of these layers came off a little too complicated. The high resolution pitch fader is a long-throw, 100mm fader with available ranges of 4, 8, 16, 24, 50 and 100% up and down. This works across all media (CD, USB and flash card, etc.). The pitch fader lives up to its high resolution label: at 4% you have a .02% resolution, whereas at 100% you have .5%. In general the mid range leaves you with an accuracy up to 0.1%, which is more than adequate for good beat mixing. When you engage Master it works as a Key Lock, which holds very well up to 25%. However, beyond that point and almost any other controller or software starts introducing artifacts at least a little. You are able to “type” in the BPM using the browse wheel, have the unit automatically detect it, or read the id3 tag if you’re using mp3s. The auto detect was accurate about as often as Traktor Pro is. Looping control works just like we all want it to. Drop the loop in, hit the loop out and when you’re done hit Reloop/Exit. If you want to go back to it, hit Reloop/Exit again and it’ll jump back to the loop point and activate it. Be sure to be accurate with that hit, though, since there’s no sync and you’re all on your own. They’ve also added a Loop Move feature, layered into the loop control with the jog wheel. After the loop is active you can adjust it with the jog wheel by tapping the Loop Out button. This was a well thought-out solution to a problem I know I’ve run into banging out a loop in a club. There are three available hotcues per track, and setting these is a breeze. While the track is playing just hit one of the three numbered buttons and a hotcue will load, designated by the red wave form turning yellow at the drop point. The button will also light up a bright green. Adding and deleting hotcues is a breeze on this unit, which I was very thankful for as some hardware units make adding hotcues a little more of a pain than is necessary. The jog wheel is understandably the part of the unit most people are going to be curious about. I’m happy to report that feels exactly like it should. For my preference I dialed down the tension to 0 and had it gave me the response I wanted. Keeping in mind that I’m not a scratch DJ by any stretch of the imagination, just doing little things here and there I noticed no drift at all. The tension adjust that goes from extremely tight to very loose. The unit also has a start and stop adjustment, allowing the user to really fine tune the interaction they want with the jog wheel. Without vinyl mode on, the jog wheel will act as a pitch bend exclusively, regardless of whether or not you touch the top of jog wheel. When you activate FX, though, the non-scratch FX are controlled with the jog wheel. With Vinyl on two things happen: 1) touching the jog wheel engages scratching and 2) the available FX change (more on this later). All in all, the jog wheel does exactly what it’s supposed to do, feels as good as it should. Slip is an often overlooked feature for manufacturers, and seeing it on a low cost deck like this is a nice touch. When you scratch, loop or reverse it the deck will remember where you would have been had you not engaged those features and when they are disengaged it continues on where it would have been. This worked perfectly, and was a lot of fun to play with. The display also changes when you activate Slip. Instead of showing you the position you are at with Loops or while Scratching it will show you where the track will end up when you release the effect. This made using more advanced functions just that much easier. You could cross reference on the screen where you were currently while the display on the jog wheel shows you where the track will end up. Once again, a very well thought out addition. This is the part of the unit I believe Gemini drops the ball on the most. There are six effects available: filter, flanger, echo, wah, “trance”, and “bubble”. The first three FX are controlled by the jog wheel when not in Vinyl mode, as well as the touch screen with a strip the comes in you can drag your finger over. This also reflects the value the Jog wheel is at. The jog wheel can either act as a touch control for the effect, or you can toggle Hold. The Filter is a single bipolar filter. The High Pass half seems to stop cutting off extra frequencies about half way up, though the resonance never gets overwhelming. The Low Pass sounds a lot better and feels like it has a wider range of cut off. The Flanger sounds okay, though I couldn’t hear a noticeable difference between each end of the spectrum. It doesn’t sound like it gets faster or slower, wider or narrower, or anything, really. The Echo works the best of all of the FX, giving noticeable changes as the effect is changed. It sounds crisp and musical over tracks and can lead to some nice experimentation. The other scratch effects: Wah, Trance, and Bubble are not my speed at all. I just really didn’t like the way they sounded while scratching, or without scratching. There is also no real parameter control, the jog wheel working as an on/off. I would have liked a little bit of parameter controls to tailor them to my tastes, but your experience may differ. If you are in need of effects while mixing the filter and echo will do, but beyond that I am not so sure how much mileage you will get out of them. I tested the interface with their new ASIO drivers and was very happy with the response I got. I was able to get Traktor going with four FX, two decks playing and loops with no noticeable glitches or latency whatsoever. It wasn’t as loud as my Audio8 but easily kept up with my eBox44, and was considerably louder than my Twitch. Every function, other than the tension adjust, communicates MIDI, giving any user a lot of alternatives if they want to use these with any major DJ software. The CDJ-700 also provides direct HID integration with Virtual DJ and, as expected, it feels as accurate and well put together as it should. A slight frustration, though, is the lack of a headphone output. For any DJ who is interested in using this as a controller they would still be required to use two decks and a mixer to get any sort of useable solution. I know it isn’t the primary use of the deck, but it would have been a nice addition. For the number crunchers, it provides both 16 and 24 bit depth and 44.1, 48, 96 and 192kHz sampling rate; provides RCA and S/PDIF outs; can load CDs, CD-Rs and mp3 CDs; and the USB and flash cards support WAV, MP3, AAC and AIFF, allowing for a lot of flexibility. I noticed absolutely no problems with sound quality of any file type. I think the CDJ-700 is a good CD deck. Someone just getting into DJing that is scared off by the massively high price points of other full size platters could find a good deck here. The basic controls work smoothly and the screen is one of the most detailed. All of the features we expect to work are pretty much flawless. The jog wheel feels exactly as it should with absolutely no hiccups and the pitch fader provides all of the accuracy you’d expect from a higher end media player. However, once you start digging down into the more advanced functionality you are left wanting. I was very disappointed by the implementation of the touch screen as well as the sound of most of the effects. The audio interface served its purpose for external mixing but I really think adding a headphone out would have just given someone that extra bit of flexibility. As a backup system or a starter kit it definitely does exactly what it needs to do. I could definitely see users, however, finding themselves wanting more very quickly as their skills increase. And as an additional note, there are a lot of great ideas implemented on this unit. While I am not excited for this piece of gear itself, I do see an improved direction Gemini is taking, if they are willing to take the features here to the next level. 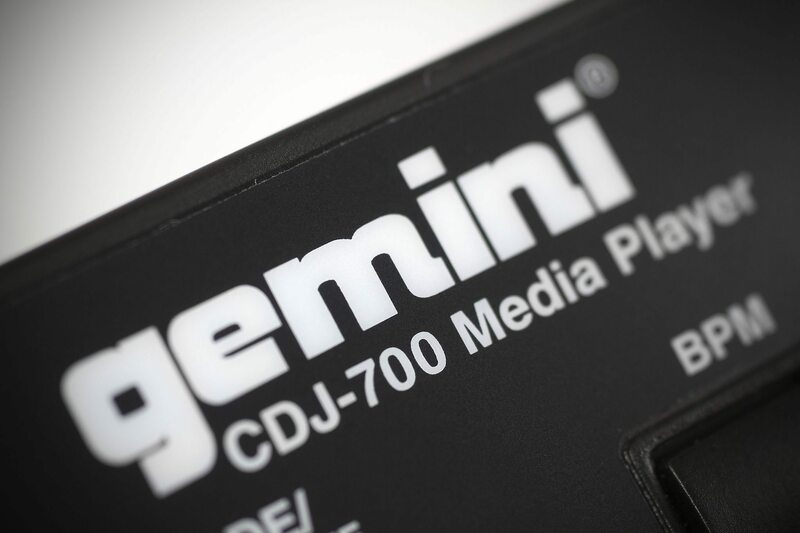 We all know that this once classic manufacturer’s reputation has taken a pummeling lately, but if Gemini can use the features on the CDJ-700 and really refine them they could have a very good contender for a low price point CD Media player. It’s a hefty deck, not too light but primarily plastic, and the buttons feel like they could take a pounding before any real damage would be done. The LEDs are bright and responsive, and the touch screen doesn’t feel flimsy. The placement of the SD and USB key slots did leave something to be desired, though. It sounds like a CD deck. There is nothing spectacular here one way or the other, but that’s exactly what we as reviews and users expect. It is far from a critique. There’s a lot of great ideas here, but they aren’t exactly put together in the best of ways. As said before, the touch screen feels more gimmicky than useful and the effects leave a lot to be desired, but the layering of controls are really well thought out and the core functionality works as well as any other media player on the market. The CDJ-700 is great for a beginner who wants to start on a full size deck as opposed to a smaller unit. While the platter isn’t motorized, the adjustable tightness feels good. 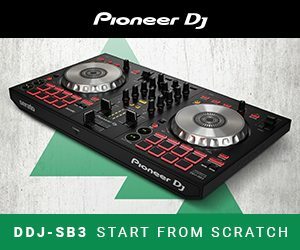 If you are just getting into CD DJing, or want a good backup unit for your expensive decks, this is a great way to go. As a old school vinyl based DJ, I’ve never been the biggest fan of CD units. I’ve leapfrogged over them to get to controllers than offer me a proper step forward. But that doesn’t mean that many DJs can’t make good use of them. And they do, all over the world. But it’s fair to say that the market that this particular deck is aimed at cannot afford the deck that it aims to emulate. But in making a lookalike, compromises have been made along the way. Stepping up to the CDJ-700, you immediately see that it wants to have “Pioneer” in front of that. This is for the people who want to look they have Pioneer CDJs, but cannot afford or refuse to pay the price tag. So at first glance, the owners will look the part. It certainly feels the part – while like CDJs it has an all plastic build, but I wouldn’t mind roughing this one up a little, and would still expect it to work. And in use, it works just fine. CDs play as you might expect, and external media plugged in performs without issue. I like the hot cues, but find the loops to be basic – some crunching or rolling would have been nice, but you can get round it with setting a cue point and hitting it like a roll. Unlike Jared, I found the platter to adjust from heavy to still a bit too heavy for more adventurous scratch tricks (perhaps a demo unit has loosened up? ), but just fine for basic stuff. But I do love the inclusion of slip mode – it makes the CDJ-700 more fun than utility, and just that little bit more Pioneerish. The screen is a nice gimmick, but as Jared states could have been done so much better. We’ll have to live with it being portrait but could be improved, such as hot cues appearing as a full solid line rather than a blip on the waveform. Perhaps a vertical waveform option would be a good idea. I found myself not touching it at all. The effects are the biggest let down for me. They fail to inspire, and just feel lacklustre. Jared has already covered this but I’m in total agreement. That said, I’d rather have them than not. Of the shortcomings, I feel that the screen could be improved with some firmware upgrades – if there’s a physical button for it, there’s no need to have one on the screen – just a small indicator will do. And let’s have a vertical waveform too, as well as being less “big print” and more clever use of space. The actual screen, regardless of touch or not, is a real draw. I hope Gemini can do some more work with this. With a few tweaks, the CDJ-700 could have been amazing. But looking past the few shortcomings, the Gemini CDJ-700 is a a pretty decent unit and a solid performer for the price.